With the first day of spring quickly approaching, you might be eager to get back into your garden. However, before you get start getting your hands dirty, it’s important to prepare with clean, sharp yard care tools that will lead to many productive hours living life outside. Some of the most common backyard culprits, such as sticky sap, rust and harmful residue can all do a number on your tools—and in turn, your lawn and garden. To tackle rust, soak the affected metal in vinegar for about 20-30 minutes and scrub the rust off with a soft brush. For more difficult areas, try chemical rust removal products, and then use a spray-on rust guard to avoid rusting in the future. Sticky sap or plant residue will come off easily with some turpentine or kerosene. For a gentler option, try an alcohol-based hand sanitizer. For any tools or flowerpots that might have fertilizer or diseased plant residue, create a 10% bleach solution and soak them up to 30 minutes, then rinse well with water. Finally, for tools that need some extra polishing, fill a 5-gallon bucket or pot with builders sand and pour a quart of linseed oil over it. Plunge the tool in a few times to get it oiled up. You aren’t going to get much pruning done if your garden shears are blunt from years of gardening and landscaping. You can take your shears and other sharp tools to a professional for sharpening or do it yourself. Using a 10” flat mill file, follow the angle of the blade’s bevel and grind toward the sharp edge, always in the same direction. For items that need a finer edge, such as smaller clippers, follow up with a whetstone to polish it off. The sprayer you use for pesticides and weed killer should get a refresh before you fill it with anything else. For most chemicals, an ammonia soak does a great job of cleaning the tools. Begin by pumping water through the nozzle at least 10 times, far from other people and your plants. Next, fill the reservoir with a solution of three gallons of water plus one cup of ammonia and spray a few times. Then, remove the nozzle and submerge it completely in the solution, letting the two pieces soak for 18-24 hours. Finish with a final rinse-and-spray with water. Make sure that you dispose of all chemicals safely. Pouring them down the drain is illegal and can contaminate the water. Instead, contact your local household hazardous waste disposal center for instructions on proper disposal. Like your car, a lawn mower requires regular upkeep to run at optimum performance. Follow these steps for a DIY tune up, then get back to proper mowing. Change the gasoline and oil. Liquids that have been sitting all winter are a common reason that lawn mowers won’t start. Check the air filter. Foam filters can be cleaned, and paper filters can be replaced for a low cost yearly. Replace the spark plug. The spark plug not only helps your lawn mower start quickly, it keeps it running efficiently all season. Sharpen the blade. You can try this on your own using that same file for your garden tools, but it can be tricky, or visit your local mower repair shop. Lubricate the wheel bearings to keep everything smooth. Make sure to wipe off the excess so it doesn’t trap dirt. 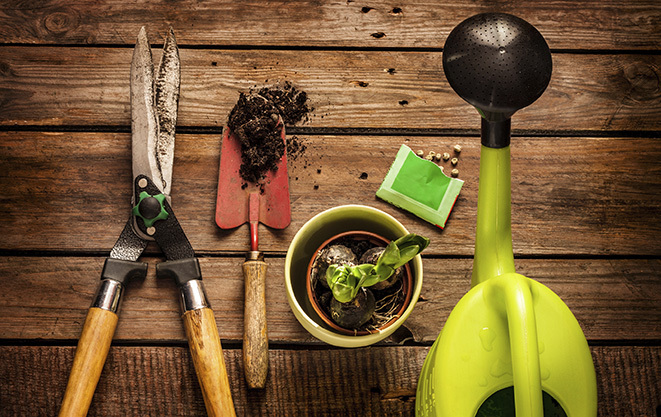 Hopefully by following these maintenance tips, you’ll be even more prepared to enjoy your time in the yard and garden this spring. Memphis, Tennessee-based TruGreen is the nation’s largest lawn care company, serving more than 1.9 million residential and commercial customers across the United States with lawn, tree and shrub care. TruGreen believes more life should be lived outside and is committed to providing a beautiful lawn to serve as the foundation for outside experiences and lifelong memories. Go to http://www.TruGreen.com or http://www.facebook.com/TruGreen for more information about TruGreen.